New spy shots show the all-new Volvo XC40 compact crossover may have a more dressed-down interior than its bigger XC90 and XC60 siblings. The photographs show a simpler cabin without the wood trim in the new models built off Volvo's Scalable Product Architecture platform, including the XC90 and XC60. 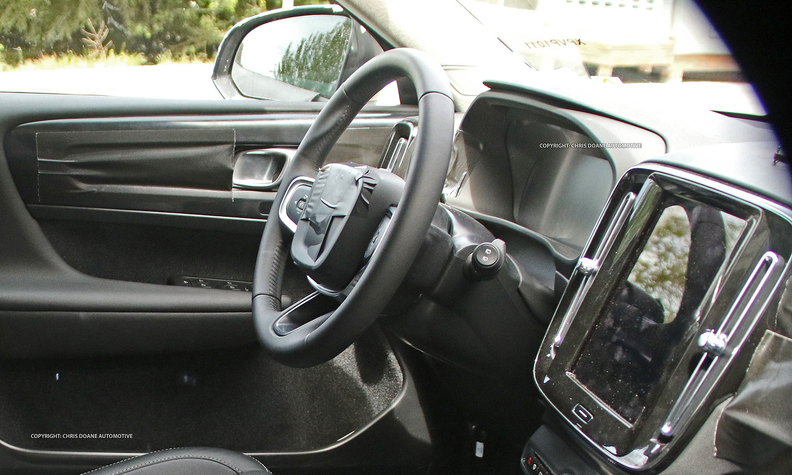 But the XC40 does appear to share those vehicles' 9-inch infotainment touch screen. Though the vehicle is heavily camouflaged, exterior shots reveal the Thor's hammer LED headlights, which have become a hallmark of Volvo's latest models and were featured on the 40.1 concept unveiled last year. The XC40, set to be introduced by the end of 2017, marks the revival of Volvo's compact 40 series. It will be built on Volvo's front-wheel-drive Compact Modular Architecture platform, which was co-developed with parent company Geely and will be shared with the Lynk & CO brand. Like its siblings, the XC40 most likely will run on a four-cylinder -- or three-cylinder -- engine. A plug-in hybrid variant is expected to be available after the crossover's initial launch.